How Does Electronic Rust Protection (ERPS) Work? The process of electronic rust protection can be a little complicated at first as it involves both electrical and chemical properties. To make things a little easier, we’ve created this 3-part video series to explain each part of the process. If you’re looking for more in-depth information you can find the written explanation below. The process of rusting is fairly scientific, but we’ll try and explain it in laymens terms for ease of understanding. Basically, the process of rusting is a naturally occurring chemical reaction with electrical properties. 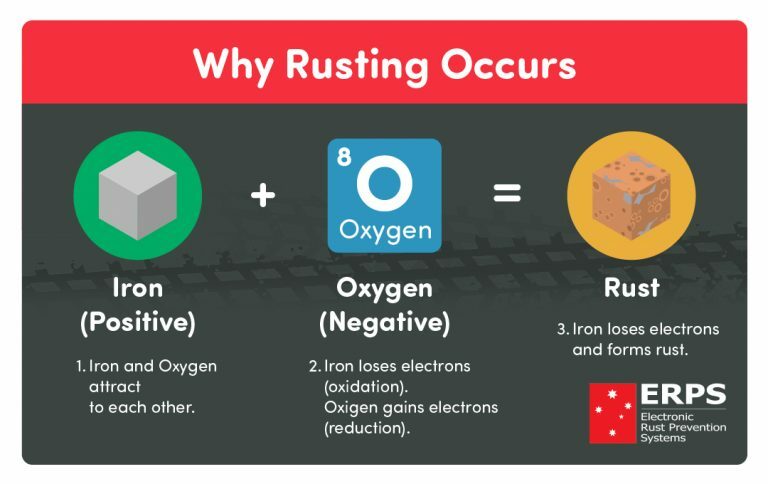 What this means is that when iron (what your vehicle is made of) comes into contact with oxygen (what its surrounded by), the end result is rust. This occurs as the electrons in the iron are lost when they combine with oxygen and as a result, the metal breaks down. The addition of an electrolyte such as moisture or salt water further accelerates this reaction. 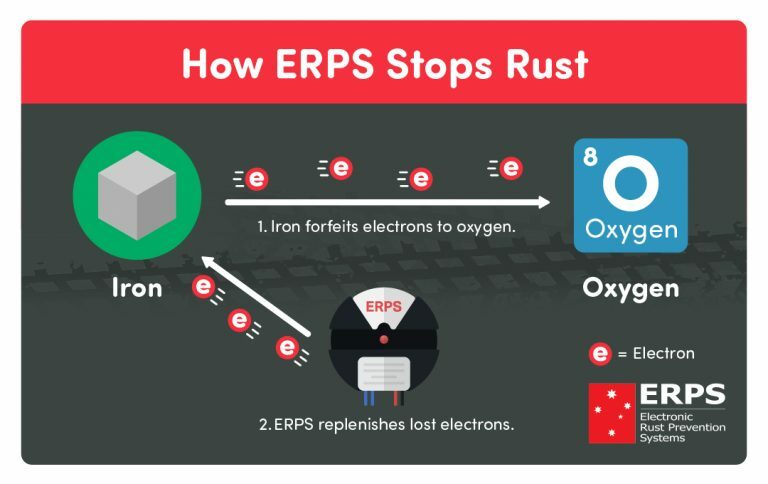 The ERPS system aims to replace lost electrons in steel using a negative charge, ultimately reducing the rate of corrosion. The ERPS system uses a technology known as capacitive coupling. 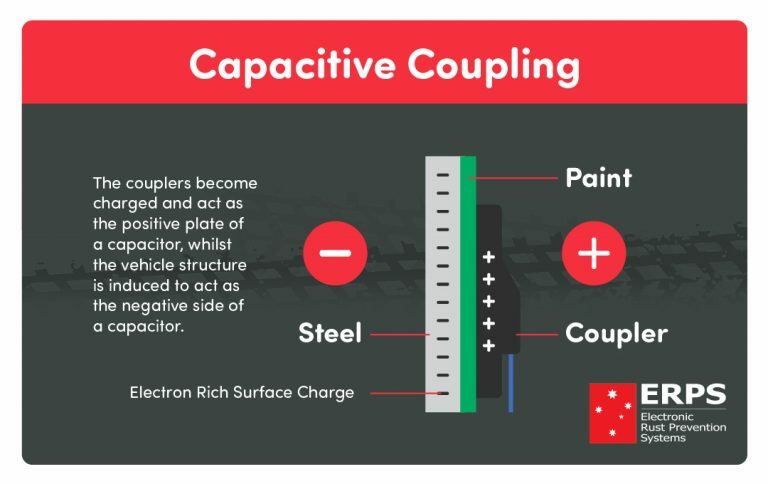 Capacitive coupling uses power derived from a system generator, to power a number of pads (known as couplers) around the vehicle. The couplers become charged and act as the positive plate of the capacitor, whilst the vehicle structure is induced to act as the negative side of the capacitor. The end result, is that this type of system does not require an aquatic base and is suitable for cars, 4wd, busses, trucks and other ‘free air structures’. The system then basically sends a negative charge through the entirety of the vehicle, which aims to stop the rusting process. Iron (the base element of steel) rusts when exposed to oxygen. As most vehicles, machinery and structures are above-ground this reaction is happening all the time. Basically, an ERPS system seeks to slow down the natural rusting process. It does this by supplying excess electrons to the Iron structure, which reduces the rate of rust. Though we get a lot of positive feedback of our systems 'stopping' rust - the truth is, rust will always occur. However, with the addition of a good ERPS the effects of rust can be dramatically reduced. 1.What is rust and how does it form? Before we outline a solution, it’s important to understand the problem or question at hand. Basically, Iron loses electrons when it combines with oxygen and rust forms (moisture and salt increase the rate of reaction). For more details on this, you can check out our full article on rusting here. The process of rusting is a naturally occurring chemical reaction, with electrical properties. Simply put, electrons escape from unprotected metal, combine with atmospheric molecules and rust begins. 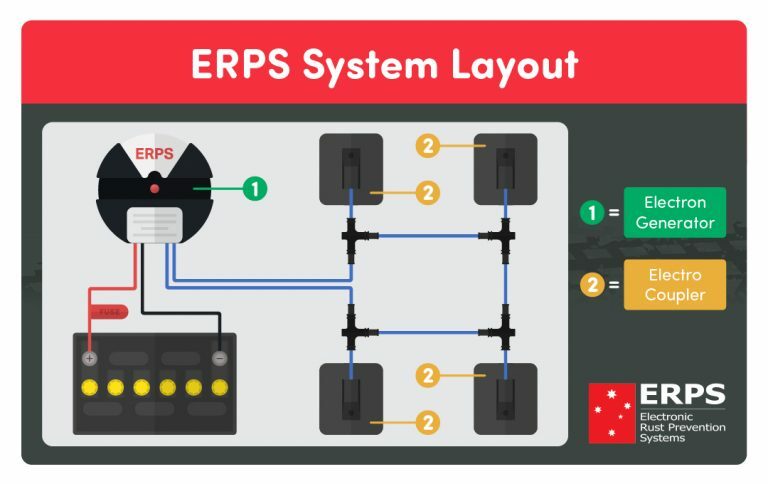 The ERPS system applies a negative charge to the body of the vehicle. As a negative charge is electron rich, it replaces lost electrons to the steel which slows or prevents rust by lowering the metal’s voltage potential. As a result, the metal becomes less reactive and therefore less likely to corrode. The ERPS system consists of an Electron Generator that is attached to a series of Electro-Couplers. Generator – Hard wired to the vehicle battery, drawing a small current (approx 20 milliamps). Couplers – The distribution point for the charge. The Electron Generator steps up the battery voltage and transfers this charge to the electro couplers. The couplers become charged and act as the positive plate of a capacitor, whilst the vehicle structure is induced to act as the negative side of a capacitor. This simple capacitive effect caused by the ERPS generator and couplers causes the metal of the vehicle to become negatively charged. A negative charge is electron rich, thus supplying an excess of electrons to the body of the vehicle, slowing or stopping the rust reaction.